Omnichannel or opti-channel. Find out which is preferable. To meet growing customer expectations for products and services that accommodate their individual needs, insurers should embrace personalization and make it central to their business model. Key strategies include choosing between an omnichannel or opti-channel approach to personalization, and extending a strategic framework to include an evolution and enrichment component. Companies using an omnichannel approach to personalized services aim to provide a seamless experience to customers both online and offline, integrating all channels so customers can choose how and when they consume a product or service. However, even with the best intentions, often a channel is imposed on customers who prefer not to use that channel—making it a strategy than can be less than effective. What’s needed instead is a customer-led communication strategy based not only on the customer’s channel preference but also on customer data and journey mapping. It’s about optimizing channels and content to ensure that customers get the right message at the right time using the most appropriate delivery method. This is what’s known as an opti-channel approach. Collect data through the various channel touchpoints, including email, phone calls, in-person meetings, service requests and responses, and updates from social media sites. Create a 360° customer profile, using advanced analytics to gain new insights. Build an effective communication strategy in a customer experience management environment, optimized for individual customers. 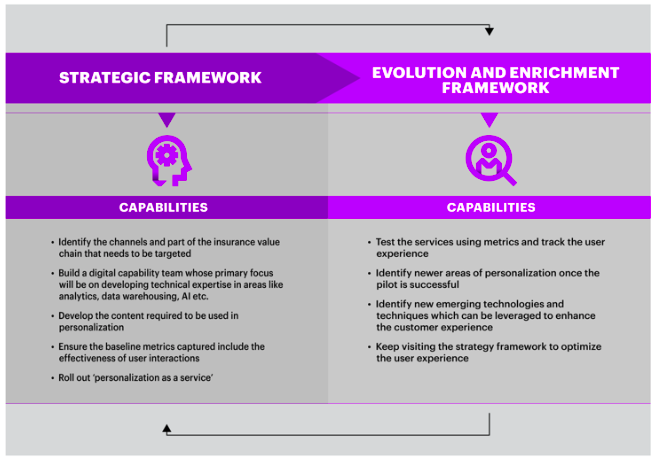 Most insurers wanting to tackle personalization will do so using a strategic framework. They will identify the channels and areas of the insurance value chain they want to improve, build a digital capability team whose primary focus is to develop technical expertise in areas like analytics, data warehousing and AI, and develop personalized content. All of these things are critically important. Identify additional areas of personalization once the pilot is successful. Leverage new emerging technologies and techniques to meet growing customer expectations. Revisit the strategy framework more than once to optimize the customer experience. Listening to customers and meeting their expectations is what lies at the heart of insurance personalization. Insurers that do this the best, and find ways to be hyper-relevant in their customers’ lives, will be the carriers that gain the most competitive advantage from personalization.